Patented pink lozenges with a sweet and fresh taste. Softening and cooling. Contains 18 amino acids and trace elments of watermelon and pennyroyal to relieve dry throat and symptoms associated with screaming too much at a rock concert, throat soreness, tonsilitis, oral erosion, mouth and tongue sores, gum abscess, acute and chronic pharyngolarynigitis, mouth ulcers, stomatitis, swelling painful gum. 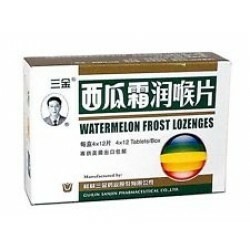 Ingredients: Watermelon fruit, menthol, pennyroyal, sugar, citric acid, dextrin, talcum powder. Directions for Use: keep in mouth, 2-4 tablets per hour. 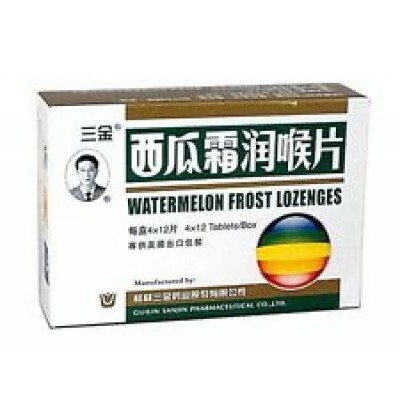 Contents: 48 lozenges - each lozenge .6gm.